Key West Camping, Key West RV Park and Florida Keys Camp Grounds Key West Camping at its best...Boyd's Key West Campground. Vacation in Key West, Florida, in the most popular Camping and RV Park in Key West and the Lower Keys by taking your family on a camping experience they'll never forget. 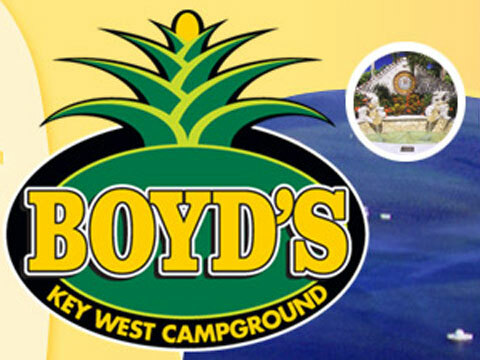 Boyd's Campground is Key West Camping at its finest. Relax in our Lower Keys Campground with your Camper, RV, or Tent facing the beautiful oceanfront. We're only minutes from Duval Street. Relax lounging by the pool, or enjoy area snorkeling, fishing, diving and beaches. Our Boyd's Key West Campground has been Family Owned and operated for over 45 years, our lush tropical park provides the perfect setting for family vacations, intimate getaways or an escape from cold winters. * Oceanfront campsites * 50 amp and 30 amp electricity * Heated swimming pool * Lounging beach * 24 hour security * FREE Wireless Internet * Marina * Gift & convenience store * 4 clean bathhouses * Located at Key West city limits * City Bus Service See why everyone who goes camping in Key West and the Florida Keys goes to Boyd's Camping. We make your Florida Keys Camping Vacation one that you will never forget!